Colombo, June 2 (newsin.asia): R.Sampanthan, the Tamil National Alliance (TNA) leader and Leader of the Opposition in the Sri Lanka parliament has told the United States House of Representatives Armed Services Committee delegation led by McClellen Thornberry, that the island nation’s leadership lacks courage to solve the Tamil issue despite the fact that the masses are ready to accept a reasonable solution. “The majority of the people in this country are willing to address the national issue once and for all. What is lacking is that the courage from the Sinhala leaders to go out to the people and explicitly tell them on the need for a new Constitution and the benefits of framing a new Constitution.” he said. “Some Sinhala political leaders are trying to satisfy the hardliners than being just and equal to all people in this country, they cannot go on this path forever, it will only end up in history being repeated,” Sampanthan added. “We may have to rethink and our people will be forced to rethink our position if things do not go well and if things are not achieved within a certain timeframe Sampanthan,” he warned. 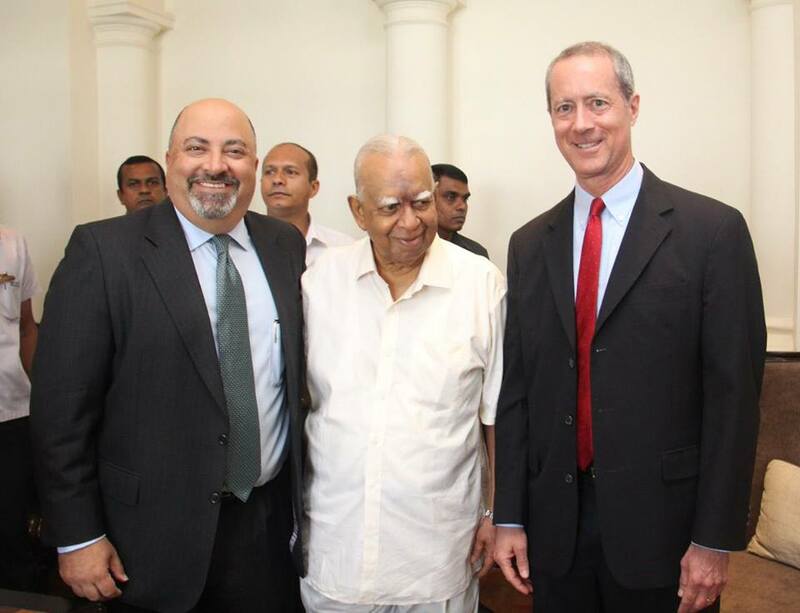 The US House Armed Forces Committee delegation comprised: McClellen Thornberry, Enrigue Cullar, Vicky Hartzler, Carol Shea-Porter met Sampanthan here on May 31. United States Ambassador to Sri Lanka Atul Keshap was also present at the meeting which lasted for 45 minutes. The TNA leader emphasized the importance of both President Maithripala Sirisena and Prime Minister Ranil Wickremesinghe working together in order to find solutions to fundamental issues and taking this country forward. “We are unhappy about the way the country is progressing,” Sampanthan said. Sampanthan said that role of the International community with regard to Sri Lanka must be defined in relation to the UNHRC recommendations. “The International community must ensure that the promises and the commitments given by the Sri Lankan Government are adhered to and implemented. The International community cannot be a spectator anymore with regard to Sri Lanka, if the government of Sri Lanka continues to fail in their commitments the international community must clearly state their position on their follow up mechanisms to safeguard the victims and ensure the non-recurrence of the past,” Sampanthan emphasized. He said that the Tamils want a solution within a united undivided and indivisible Sri Lanka. The power-sharing arrangements should be in accordance with the international covenant on Civil and Political Rights, International Covenant on Economic Social and Cultural Rights and the Universal Declaration of Human Rights, he added. Expressing his concerns on the stalled process of drafting a new Constitution, the Tamil leader said that the efforts to draft one should not be abandoned. The legitimate demands of the Tamil people in finding a lasting solution to the national question could only be addressed through adopting a new Constitution, he argued. Sampanthan highlighted that his party is confident that if the Constitution is passed in Parliament with a two-thirds ajority it will be approved by the people at a referendum, which is necessary for a new Constitution he said. The Tamil leader reminded the delegation that the Government of Sri Lanka has given a Commitment to fully implement the UNHRC resolution adopted in 2015 before March 2019. “They must fast-track their process to achieve those commitments,” Sampanthan said.